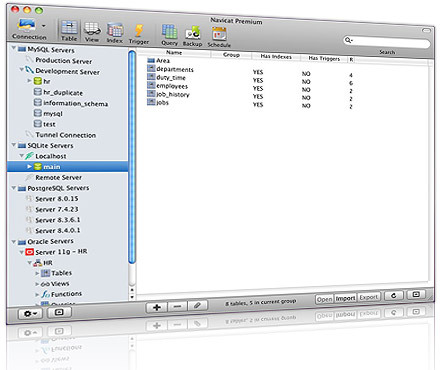 Navicat Lite for Mac is a multi-connections Database Administration tool for Mac OS X allowing you to connect to MySQL, SQLite, Oracle and PostgreSQL databases simultaneously within a single application, making multiple database administration so easy. Navicat Premium includes more advanced features such as data transfer between MySQL, SQLite, Oracle and PostgreSQL and running Batch job for different databases at a specific time. ...... Oracle and PostgreSQL databases. Navicat Premium includes more advanced features such as data transfer between MySQL, SQLite, Oracle and PostgreSQL and running Batch job for different databases at a specific time. Navicat Lite for Mac Other features include Import/ Export Wizard, Query Builder, Report Builder, Data Synchronization, Backup, Job Scheduler and more. Navicat Premium also supports to import data from ODBC, batch job scheduling (create schedule for Import/Export, Data Transfer and saved queries), printing of table structure. Navicat Lite for Mac also includes a full featured graphical manager for setting the users and access privileges. Navicat version 8 supports Code Completion, Form View and email Notification Services, etc. Qweas is providing links to Navicat Lite for Mac 10.0.2 as a courtesy, and makes no representations regarding Navicat Lite for Mac or any other applications or any information related thereto. Any questions, complaints or claims regarding this application Navicat Lite for Mac 10.0.2 must be directed to the appropriate software vendor. You may click the publisher link of Navicat Lite for Mac on the top of this page to get more details about the vendor.